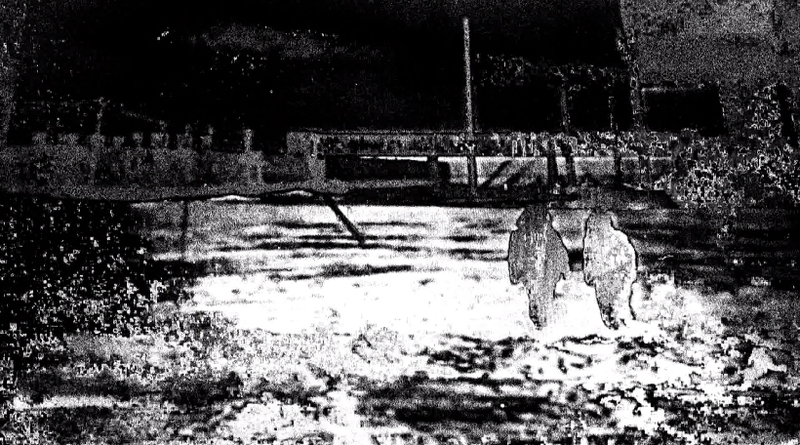 The Hum is a 25-minute black & white experimental video with an original soundtrack by Yaki_Pony. Not everyone can “hear” the Hum, but the vibroacoustic effects of infrasound causes victims to describe it as something that is felt more than heard. Wherever The Hum appears, etymology melds with geolocation: the Taos Hum, the Bristol Hum, the Auckland Hum. In early 2011, Windsor, Ontario—a stone’s throw across the river from Detroit—developed its very own Hum. The cause of The Hum has alternately been blamed on local underground salt mining and the VLF bass waves emanating from the industrial smelting factories on Zug Island. The presence of salt and steel have left their impression on this work. The Hum reconstructs a visual and sonic impression of the spatial, psychic-industrial, and physiological effects of this mysterious event upon people, animals, and local landscapes. The soundtrack samples interviews with the Hum-afflicted, field recordings of the phenomena, and has “sonified” local dirt and rock salt with the use of an analog synthesizer—in sonic solidarity with the environment.